When someone has had serious praise (and a sackload of songs) from Bruce Springsteen and he’s described by Jon Bon Jovi as the reason he got into music, you know there has to be a story there. 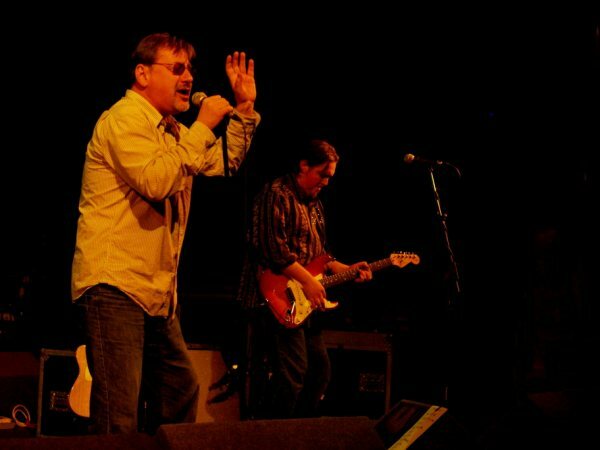 The man in question is John Lyon, or Southside Johnny, and he’s aided and abetted by the Asbury Jukes. The band, with many personnel changes, have been around for 35 years with a current line-up which has been fairly stable for the last 10 years (stick with me, it’s all relevant). Despite the long lifespan, this isn’t a nostalgia gig; Southside Johnny & The Asbury Jukes (shortened to The Jukes from now on) have released 4 albums of new material in the last decade and his audience expect to hear the new songs as well as the 70s classics. The audience at the Buxton Opera House were mainly the expected glad to be grey generation with some notable exceptions, including the teenager behind the mixing desk applauding the solos and singing along to songs recorded around 2 decades before he was born. The Jukes are a 9-piece band (lead vocal, guitar, keyboard, bass and drums plus horn section of baritone sax, tenor sax, trombone and trumpet) playing a huge range of material from Jukes originals to Atlantic soul and (on this particular night) Rolling Stones covers (and many, many more). The incredibly high standard of musicianship and rapport is matched by the showmanship and professionalism of the band, who respond instantly to any curve balls thrown by Southside as the show progresses. As well as playing some great blues harp, Southside has a phenomenal soul voice; think of honey poured on gravel and you’re about there. The set opens with the barnstorming “Shake ‘Em Down”, which is a great showcase because it’s a straight-ahead rocker and shows off the band at its best with big horn fills and the guitar and keyboards right up front. There may be set list taped to the front of the stage, but it’s pretty much redundant after the first song. The band, and particularly Southside, read the audience incredibly well and will play whichever song is going to work best. The fact that the band have been together so long, means that they respond instantly to any changes of direction and even call the tunes themselves at times. With a back catalogue of around 200 of their own tunes, plus about another 500 that they’ve played at some time the band are never allowed to coast. It also means that you never see the same set twice. The band are all very accomplished musicians, but they also like to put on a performance, which means that there’s always something interesting happening on stage, such as the horn section storming the front of the stage or Southside insisting that the band all sit down while he sings “Don’t Look Back” (a hit for Peter tosh in 1978, if you must know). The set (which is always at least 90 minutes long including encores) features old and new material including the big crowd pleasers such as “The Fever”, I Don’t Want To Go Home” and the wonderful Springsteen ballad “Hearts of Stone” which closes the show. The real highlights for me were the relatively new “Passion Street” featuring a wonderful tenor sax solo from Joey Stann and, of course, “The Fever” which allowed trumpet player Chris Anderson to cut loose on a solo which started as laid-back, played with a mute and finished as blistering, strident raw brass. If you want to experience a band of excellent musicians who love what they do and give everything every night, then you should really go to see The Jukes at Shepherds Bush Empire this Friday. By the way, an honourable mention goes to Ian Siegal who opened for the Jukes at the Opera House, playing a set of acoustic blues which was excellent and well appreciated by the partisan audience. A great night out and, yes, they are the best bar band in the world. Here are some exclusive pics from the gig. Dont look back originally a Temptations song! Great review! But, I must respectfully disagree with one thing you have said – just knock the word ‘Bar’ out of the title! Best “bar” band? Why the qualifier? The best band in the world — bar none. Seriously, terrific review. Thanks for posting it. i’m pleased you all liked the review. Sorry it’s take me so long to reply; things got a bit busy after the review went live. I agree that taking the word “bar” out would probably be more accurate, but I thought it make a better title. Thanks for taking the time to post your supportive comments. We should have a photo gallery from the gig live within a week or so. I’m from Alabama and he has never played here but his CD’s are all very good, may want to check it out, and see what some are missing out on!!!! His live DVD’s are also great!Someday I’m going to make my way to see him live.Thanks for the support of this Great Band. I don’t know if you’ve seen these, but I recently posted a profile of Southside and an interview on the site. I also did a review and interview with Billy Walton.